The year so far has been a very frustrating one, but we have made progress on some fronts which is encouraging. 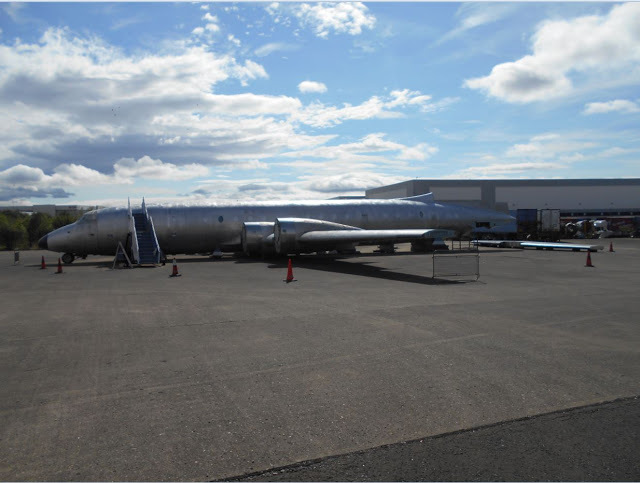 During the winter months, considerable progress had been made restoring the cabin floor with the floor being completed up to the Over Wing Emergency Exits by the time of the planned aviation fair at the end of June. As this work has meant clearing a lot of the items stored in the aircraft, this has given us the opportunity to clear out a lot of rubbish, unwanted items and inventory what we do need. This has given us a considerable area of the cabin for a display telling the story of Charlie Fox. Work also continued to progress the cockpit restoration, with a number of missing instruments being sourced and fitted. At the end of March, one of our volunteers, Delphine Ryan, started working for the Trust full time on a 6-month placement from her normal employer (the Ministry of Defence or MoD) as part of an engineering graduate scheme. This proved to be a considerable help in putting the Trust on a better footing, with the website being updated, detailed costings being put together for a number of grant applications and managing the project and volunteers. We had intended to complete the paint stripping of the fuselage and apply a coat of primer during the summer months, but this proved not to be the case as the old apron at Speke was leased to Jaguar/Landrover from the end of June to the end of October, to store new vehicles. The timing could not have come at a worse time and without any notification, as it meant the annual Speke Aviation Fair had to be cancelled at short notice thus depriving the Trust of a good regular source of publicity and revenue. Moreover, we were unable to do any exterior work as the vehicle were parked within a few feet of the aircraft. Instead, work continued on the cabin floor and the undercarriages which are located at a nearby workshop in Cheshire. These should be completed before the end of the year and returned to Speke. During the coming winter months, we plan to continue with the cabin floor & cockpit restoration and start re-installing the cabin and cockpit lighting, this being among the priority jobs. The 18th December will mark the 40th Anniversary of the final flight from Adelaide to the UK, when Charlie Fox landed back at Luton while in service with Monarch Airlines, thus completing over 11 years of operating the MoD flights to the Woomera Rocket Range in Australia. This also marked Monarch's final Britannia flight. Our biggest challenges are still the weather when working outside (we need temperatures in excess of 20 ºC.